I'll admit it, I was taken in by this band's name and that's why I started looking into them. Something about the name Lutheran Heat struck me as being funny, but not in a 'stupid band name' way. I thought it was clever. I think they had one song up at the label's Bandcamp page at the time along with a preorder for the record. I liked the song, so I decided to take a chance. Lucky for me, the whole record is pretty darn great. I actually find Louder From The Other Side similar to the Laika's Orbit record that I recently reviewed. Maybe a bit more restrained, with more songs that run mid tempo, but especially the recording and the general aesthetic of the two records have a lot in common. Lutheran Heat is playing jangly and bouncy guitar, weaving in stupendous male/female vocal harmonies and toe tapping hooks. This is a band very much playing the sort of carefree and catchy pop as bands like Title Tracks and White Wires. Needless to say I really dig this album a lot. It's always especially rewarding when you take a chance on a new band's record and it ends up being this good. 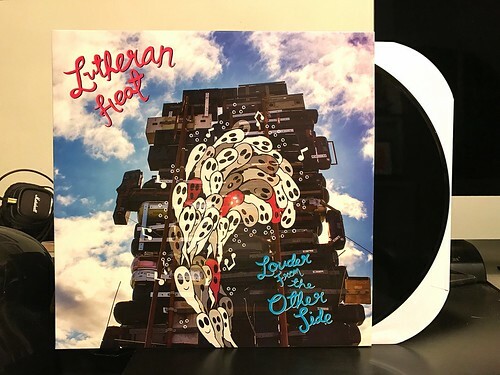 I absolutely recommend checking out Lutheran Heat, this is one of the better records I've bought all year. The Flintettes - The Choice Is Ours 7"
Made In Japan - Instant Hit 7"